Are you keeping up with our activities? Are you keeping up with the activities occurring within the Orient? Follow along by reading our Orient Newsletter, the Scottish Rite Journal, and the Journal’s Missouri section all online from your computer or smartphone. Simply click the link below! Are you receiving the Missouri Scottish Rite monthly newsletter? Are you receiving the Missouri Scottish Rite monthly newsletter? If you are not, and you would like to, please let us know using the form shown below! E-mail Opt-in(required) I would like to receive communication from the Scottish Rite and give you permission to e-mail me. I do not want to receive e-mail communication from the Scottish Rite. Below most recent OFFICIAL schedule for the Inaugural Grand Master’s Reunion as received from the Valley of Kansas City’s Director of the Work. If you have questions or corrections, please contact the Valley of Kansas City – http://srkc.org/contacts/. RSVP REQUIRED FOR ALL MEALS. The cost $10 for breakfast and $15.00 for the lunch banquet. Please reserve by calling the Valley of Kansas City office at 816.561.2277. We are excited to announce the launch of the Missouri Scottish Rite e-News! This dynamic monthly newsletter is dedicated to sharing the Goodness of Freemasonry – committed to inspiring Brotherly Love, Relief and Truth – and driven by the stories and experiences of each of the five great Scottish Rite Valleys of the Orient of Missouri. 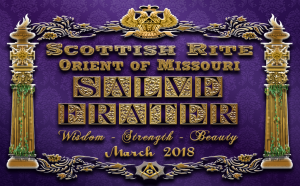 You can view the current issue by visiting https://mailchi.mp/0c0a78608070/missouri-scottish-rite-march-2018-e-news. We were informed that the upcoming Journal insert was misprinted. Please click on the link below for a PDF version of the insert. Our Orient News Page will auto-update with the HTML5 version of the insert in the days ahead. This post will be updated when that occurs. Please join us for an exciting two days of Freemasonry! CLICK HERE FOR FULL SCHEDULE! Full details at MOScottishRite.org or by calling 816.561.2277 as they become available! On September 27, 2017, the Kansas City Scottish Rite Foundation was proud to have Ill. Robert W. Cockerham, 33°, Sovereign Grand Inspector General in Missouri on-hand to assist our Valley in unveiling many enhancements to the Valley of Kansas City’s library and museum. There was a large crowd of excited members, dignitaries, and guests present for this historic occasion! The Valley of Kansas City’s newly dedicated library and museum is full of treasures and mementos of the Valley’s storied past. 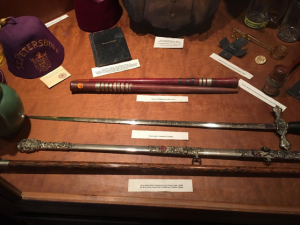 From President Truman’s petition for the Scottish Rite degrees, to Frank S. Land’s Knight Templar sword, these treasures needed to be protected. After numerous discussions regarding this need to further protect the books and exhibits, the Kansas City Scottish Rite Foundation (KCSRF) initiated a plan to fund and construct attractive and secure doors. This will also allow the Valley to add a separate heating/cooling zone to maintain proper temperature and humidity required for these preservation efforts. These dramatic changes inspired us to rededicate the library and museum. 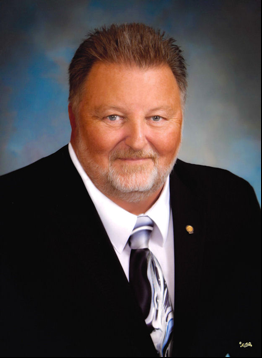 The KCSRF thought it should be named to honor a member of our Valley whose life had been a force for positive change. Early discussions resulted in the name of Brother Harry S Truman, 33°, but he already has a library with his namesake in Independence. The board quickly came to unanimous consensus to name the Library and Museum for a man whose legacy impacted the lives of millions of young men by teaching them the values of citizenship, leadership, and personal responsibility. 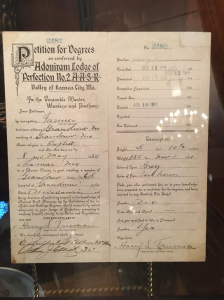 In January of 1919, Frank S. Land, Director of the Kansas City Masonic Relief and Employment Bureau of the Scottish Rite, agreed to help a young man in need. 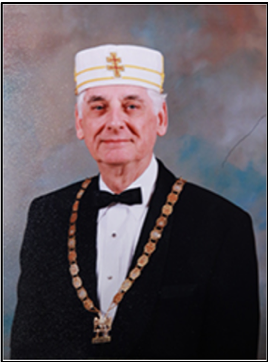 Mr. Land had no idea that this was to become the beginning of an international Masonic Youth organization; he was merely following the tenets Brotherly Love, Relief and Truth. A few months later, the Order of DeMolay was founded as a result of Frank S. Land answering that call for assistance. The Valley of Kansas City decided it is time to answer the call and build on the Land legacy by creating a resource that is hoped will inspire a new community within the fraternity. We hope to host seminars, speakers, and traveling exhibits that focus on the history, development, and philosophy of Freemasonry. All of this will be possible thanks to the Frank S. “DAD” Land, 33° GC Library and Museum. The KCSRF is currently raising money to finish the job by adding the climate control to protect the museum and library’s treasures. This project will cost between $25,000 and $30,000 to complete. 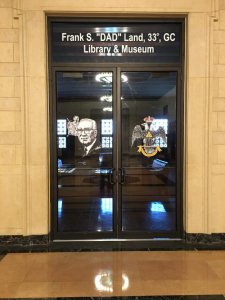 The First 100 Donors of at least $100 to the Kansas City Scottish Rite Foundation, Inc. with donations marked “FRANK S. “DAD” LAND, 33° GC LIBRARY AND MUSEUM” will be permanently recognized as members of the FRANK S. “DAD” LAND, 33° GC LIBRARY AND MUSEUM FOUNDER’S CLUB. PLEASE CONSIDER SUPPORTING THE CONTINUED DEVELOPMENT OF THE FRANK S. “DAD” LAND, 33°, GC LIBRARY AND MUSEUM VIA A DONATION USING THE FORM BELOW! Tis’ the Season – to Give the Gift of Speech! During the next 24 hours, people around the world will come together to celebrate generosity and make an impact. Will you help us reach our goals this holiday season? Please say “yes” to help a child at your local RiteCare today!